The all sky maps in Figure 02-05 shows the three views of CMBR (in false colours) with increasing sensitivity (in temperature variation). To a first approximation the sky is uniform (top). At a sensitivity level of 1 part in 1000, it reveals a shift in wavelength to blue and red (middle) . The pattern is caused by the motion of the earth relative to the frame of the CMBR. When this shift is subtracted off, fluctuations are visible at a sensitivity level of 1 part in 100000 (bottom). The red band in the middle is the emission from the Milky Way. Figure 02-06 shows the final view after all the corrections have been applied. The slight variation in temperature then takes on a blotchy appearance with each patch a little above or below the average temperature of 2.726oK. All the above-mentioned observations can be interpreted in a consistent way by the Big Bang Theory. According to this theory the CMBR was emitted about 380000 yr. after the Big Bang when neutral atoms (such as the hydrogen atoms) started to form. As the neutral atoms interact much less to the radiation, they became free and escaped the fireball at a blackbody temperature of about 4000 oK. It takes about 14 billion years to reach us and has since been cooled down to 2.726 oK by the cosmic expansion. 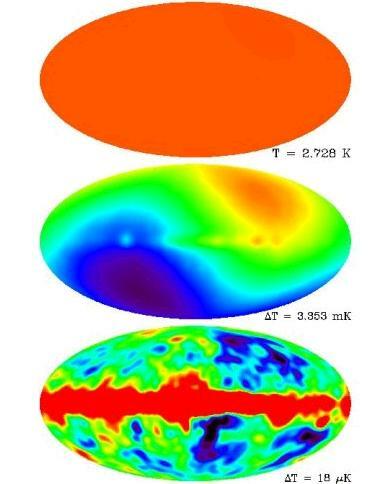 The patchy features in Figure 02-06 are related to the fluctuations occurred close to the beginning of the universe. The CMBR is the furthest astronomical phenomenon that can be witnessed by any beings because the universe was opaque before this event. It is like looking up in a cloudy day when nothing can be seen beyond the cloud ceiling.